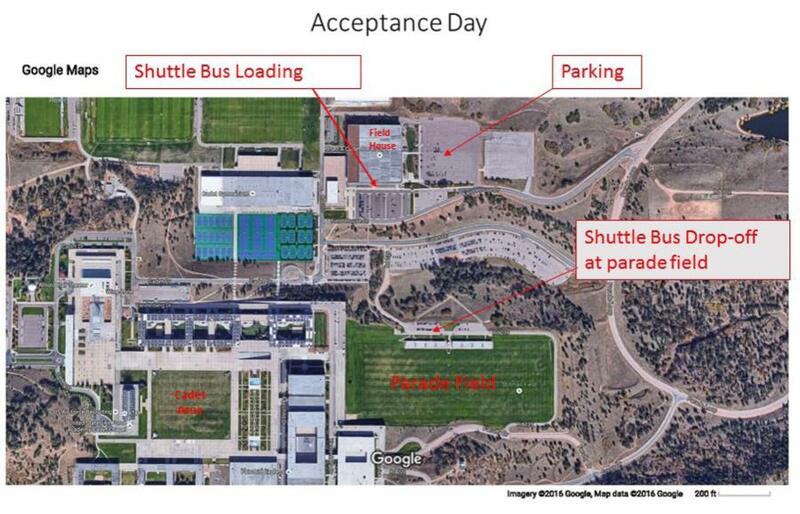 As promised, here is some information we hope will make things easier for those coming to the Acceptance Parade. First, enter the Academy through the North Gate entrance. It is the closest to the Stillman Parade Field in any case. The gate will be open for visitors at 7:00AM that day only. Normal hours for visitors are 9:00am - 5:00PM. If you have a valid DoD ID, you may enter through either the North or South Gates. Click HERE for more USAFA visitor information. Next, where to sit... Here's a diagram of the parade. If you want to sit near where your Basic will be standing, just position yourself based on the diagram below. The colored boxes at the bottom correspond to their BCT squadron and flight. If figure you already know their color, the letter is the flight #. Once they march into the wing look for that squadrons location to find him/her when you are allowed out on the field to observe them receiving their shoulder boards. Based on the diagram, Barbarians Flight A will end up in Cadet Squadron 6. 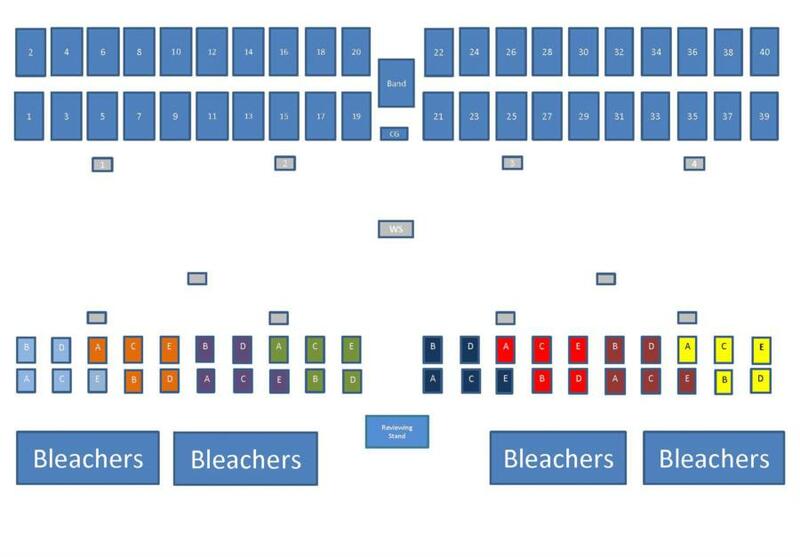 The gray boxes are where the Cadre and Cadet Wing leadership stand. Next item. GET THERE EARLY. There is usually plenty of seating at the Acceptance Parade as opposed to Parents Weekend, but if you want to sit near your cadet's squadron, then get their early. The parade will start promptly at 9:00am, but there will be pre-parade activities for you to watch. Dress code is "be comfortable", but please remember that this is a military base, not the beach. Conservative dress is always wise. Wear confortable walking shoes. Keep in mind that you will end up walking in 2 inch high grass. Plan accordingly. Be prepared to have your carried items searched. The base is in a highened security condition. DECORUM: People bring signs, wear colored shirts, etc. It is a festive occasion. That being said, be respectful. This is a military parade with the emphasis on MILITARY. After the parade when the families are invited out onto the parade field it is always pretty much of a stampede. Remember that no matter how much you want to charge in and hug your cadet, they are NOT released until they get their shoulderboards and are dismissed by their squadron leadership. Don't embarass your cadet by your lack of self control. You will have plenty of opportunity to hug them once they are released. FAINTING: Every year it seems the Basics pass out during the parade in record numbers, especially if it is hot. They are repeatedly reminded to hydrate and not lock their knees, but still it always happens. If it happens to your Basic, don't panic. You will see lots of personnel ready to assist them. Once the parade ends, they all still get their shoulderboards and are seldom worse for the wear. I'm not making light of this, just want to prepare you. We at WebGuy are as excited as you to see the parade and the happy families. We will be there to cover the parade and will be circulating among the tailgates to take your photo and say hello. For those who can't attend, the photos will be up after the parade. To answer a question that is asked every year. We will not live stream the parade and the Academy Public Affairs does not do so either. We don't have the facilities and they don't have the personnel. We will have lots of photos, however. OK. I hope this info helps. There will be coverage tomorrow of the Basics practicing for the parade, so there are still more photos to come. I'm off to watch the Olympics opening ceremonies now. Enjoy the luncheon photos! See you soon!